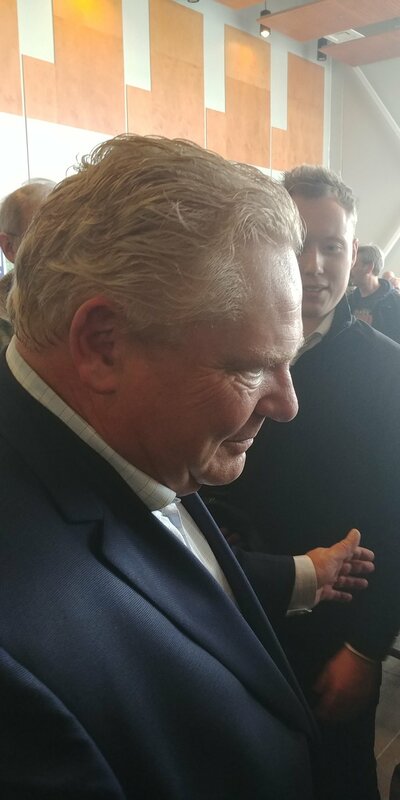 PC leader Doug Ford and Northumberland – Peterborough South candidate David Piccini packed the Grand Hall at the Cobourg Community Centre at a noon time meet and greet today. Estimates put the crowd at 250 people. Ford talked about how Ontarians are fed up with high Hydro rates, putting money back in people’s pockets, job creation, fixing healthcare, and asking teachers how to improve Ontario’s education system. In speaking with the media, he touched on getting rid of carbon taxes, the burden of a $312 Billion debt, how the next generation wants jobs and what his government would do to eliminate the deficit and begin paying down the debt.